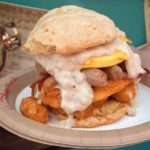 Guests staying at the All Star Resorts — Sports, Movies, and Music — should definitely make a point to peruse the bakery cases in the Resort food courts. 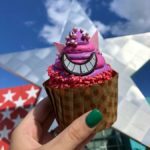 Themed character cupcakes of late have included the Cheshire Cat Cupcake at All Star Music’s Intermission Food Court. And now we’re back at the very same spot to try this month’s Merida Cupcake! A note before we dig in… you’ll notice that the sign underneath the Merida Cupcakes in the bakery case reads “$5.49” for the price, but I was actually charged $5.99, so there seems to be an error on the sign (unless I was mischarged). 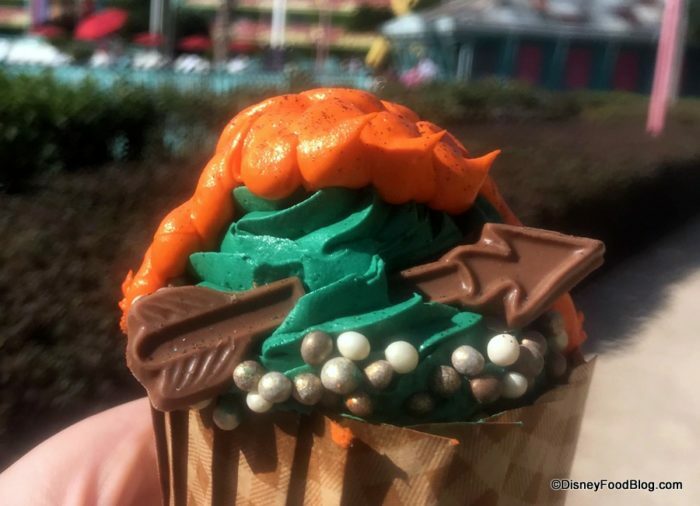 Themed after the heroine from Brave, you’ll spot a tribute in buttercream icing to Merida’s brightly hued, curly hair. 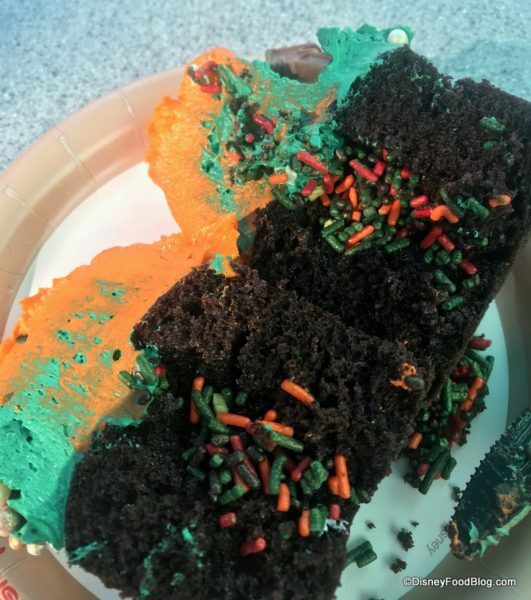 It’s layered over more vanilla buttercream which is colored green with a chocolate arrow (in two pieces) right from Merida’s bow piercing through it. The cake’s base is chocolate, and inside you’ll find a Merida-inspired selection of sprinkles toppling out when you cut or bite into the cupcake. 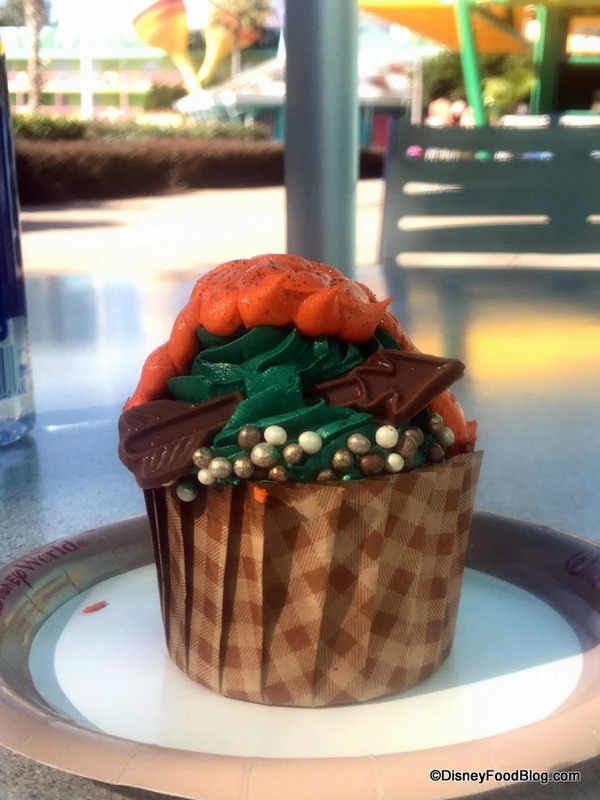 The simple flavors contrast the unique appearance of the cupcake, making it perfect for all the wee little Meridas visiting Disney World! Which character would like to see Intermission Food Court commemorate with a cupcake next? What character cupcake would you most love to see? Please let us know with a comment! 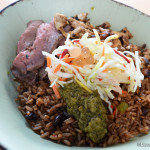 What’s New at Animal Kingdom (Satu’li Menu Updates!) and the All-Star Resorts?? NEW! 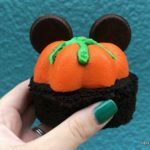 Fall Cupcakes and Treats Arrive at Disney World Resorts! « The Birthday Mickey Cake Pop in Disneyland Is Basically The Cutest Thing Ever. 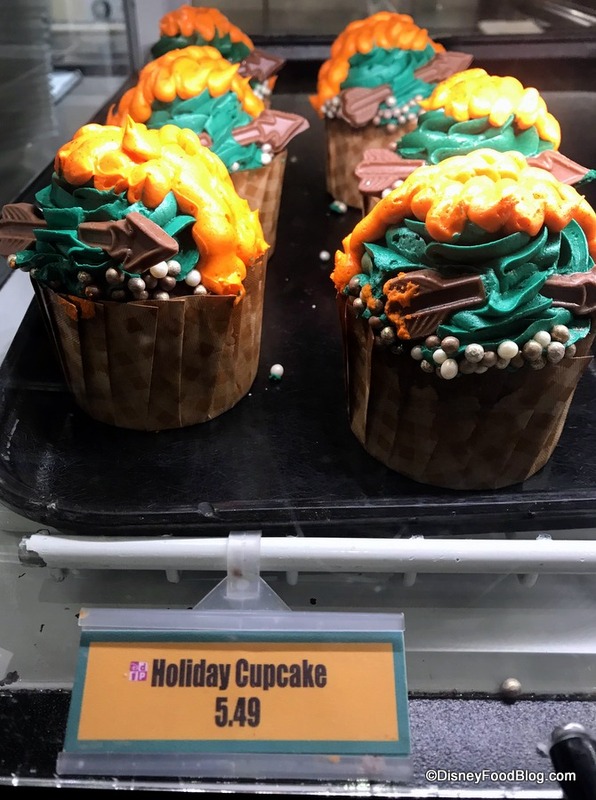 I don’t understand this latest Disney Parks trend of filling baked goods with sprinkles only. 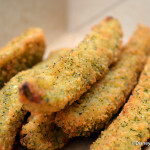 Does ANYONE think straight sprinkles are delicious? Surely they are best enjoyed with some kind of conduit like frosting. It’s just a waste IMO. I blame Instagram.